he withdrew from there in a boat to a deserted place by himself. But when the crowds heard it, they followed him on foot from the towns. and he had compassion for them and cured their sick. I'm a big fan of Dr. Brian Goldman and his CBC radio program called White Coat Black Art. http://www.cbc.ca/radio/whitecoat It explores all things medical with a curiosity and depth which always leaves me feeling better informed. He told me flat-out in the letter that he thought I was unkind, and the reason he wrote the letter was because he thought I was salvageable, that there was a human being under that moment of unkindness. Eventually, I met most of the immediate family and we all had a good cry in that meeting. It was that encounter, more than any other, that set me on this road and made me want to look inside myself — and also around the world to try to figure out what kindness looks like. 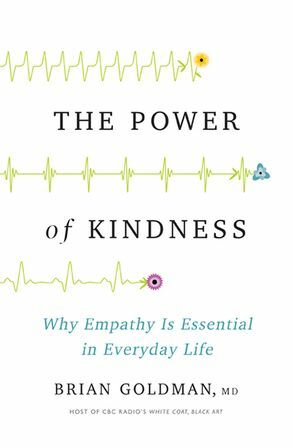 This situation motivated Goldman to reconsider how he practiced the empathetic aspect of medicine and set him on a quest to examine kindness as an essential aspect of being human. I do feel that kindness is a core value of the Christian life, and that we can live the love of Christ through compassion and kindness. During my years at Bridge St. United Church I worked with the Rev. Vicki Fulcher who was our Pastoral Care minister and also the chaplain at Belleville hospital. Vicki is one of the kindest people I know, and I think she acted as a gentle but firm "kindness conscience" in the hospital, setting an example for empathy and compassion with those who are under constant pressure to address the physical needs of patients. While it is important to have institutional chaplains who provide this leadership, I agree with Dr. Goldman that this can extend throughout the system if those involved are mindful of the importance of kindness for those who are vulnerable. This applies to all of us. As a Christian I can ask each day how I will engage in the spiritual practice of kindness, through a smile or a greeting or spontaneously asking how I can be helpful. There are many scriptural examples of Jesus' kindness, the ways he compassionately attended to those who were sick, or bereaved, or outcasts. This is a wealth we can all share if we choose. We saw this currency shared by many people who went to the aid of those injured in the terrible tragedy in Toronto a couple of days ago, and after the bus crash in Saskatchewan. Yet we don't have to wait for a traumatic event to practice kindness. I agree, David - every day kindness is a necessity in this world where, too often , we see hatred and nastiness. Well, you are a kind and generous person Judy, so you're "walking the talk."